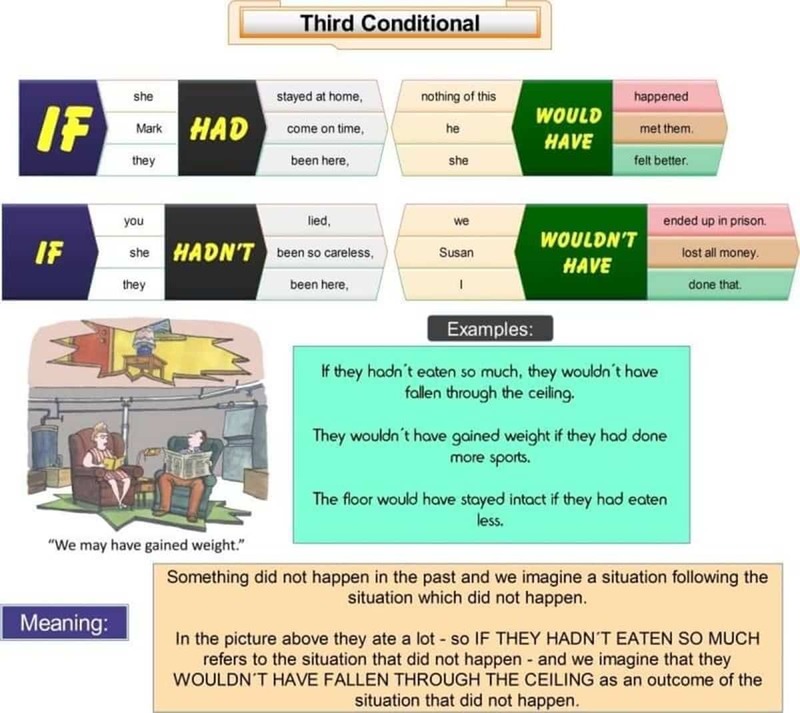 There are Four Types of Conditionals in English Grammar. Conditional sentences are sometimes confusing for learners of English as a second language. 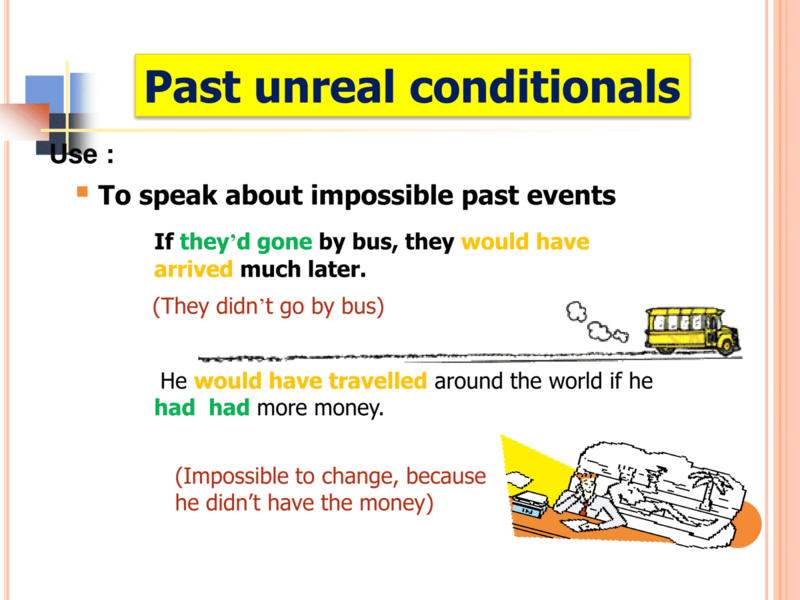 What are conditionals in English grammar? Conditionals are sentences with two clauses – an “if” clause and a main clause – that are closely related. 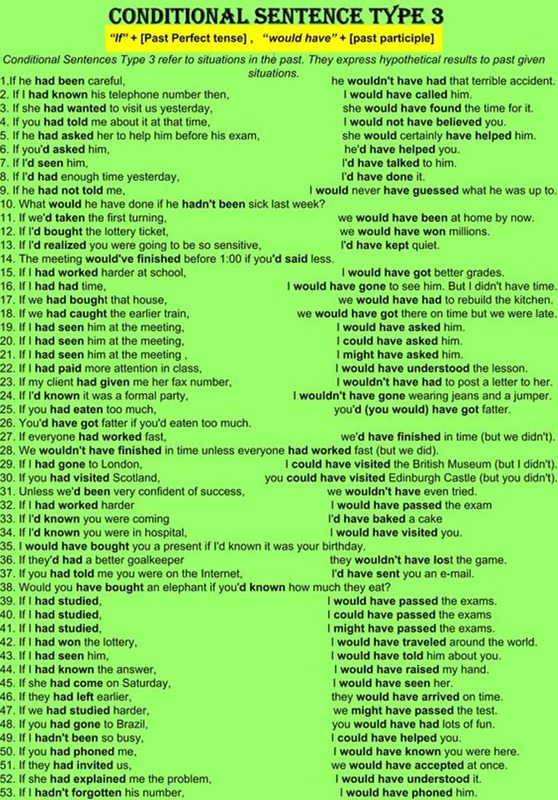 Conditional sentences are often divided into different types. “Zero conditional” refers to conditional sentences that express a factual implication, rather than describing a hypothetical situation or potential future circumstance. The term is used particularly when both clauses are in the present tense; however such sentences can be formulated with a variety of tenses/ moods, as appropriate to the situation. If you don’t eat for a long time, you become hungry. If the alarm goes off, there’s a fire somewhere in the building. If aspirins will cure it, I’ll take a couple tonight. “First conditional” refers to a pattern used in predictive conditional sentences, i.e. those that concern consequences of a probable future event. In the basic first conditional pattern, the condition is expressed using the present tense (having future meaning in this context). In some common fixed expressions or in old-fashioned or excessively formal, the present subjunctive is occasionally found. The consequence using the future construction with “will” (or “shall”). If need be, we’ll rent a car. “Second conditional” refers to a pattern used to describe hypothetical, typically counterfactual situations with a present or future time frame (for past time frames the third conditional is used). In the normal form of the second conditional, the condition clause is in the past tense (although it does not have past meaning. 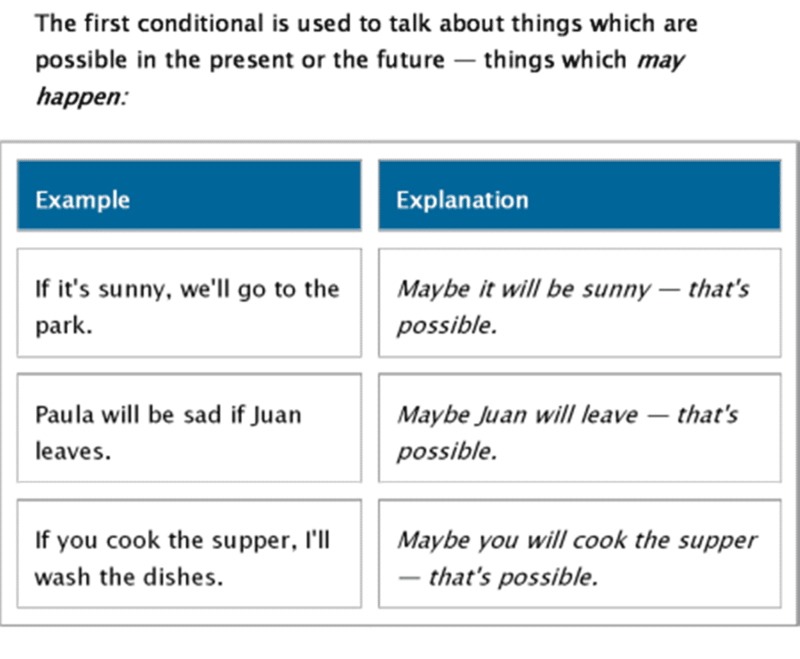 The consequence is expressed using the conditional construction with the auxiliary “would”. “Third conditional” is a pattern used to refer to hypothetical situations in a past time frame, generally counterfactual (or at least presented as counterfactual). Here the condition clause is in the past perfect, and the consequence is expressed using the conditional perfect. “Mixed conditional” usually refers to a mixture of the second and third conditionals (the counterfactual patterns). Here either the condition or the consequence, but not both, has a past time reference. If you had done your job properly, we wouldn’t be in this mess now. If I hadn’t married Kelly, I wouldn’t be living in Scotland now. 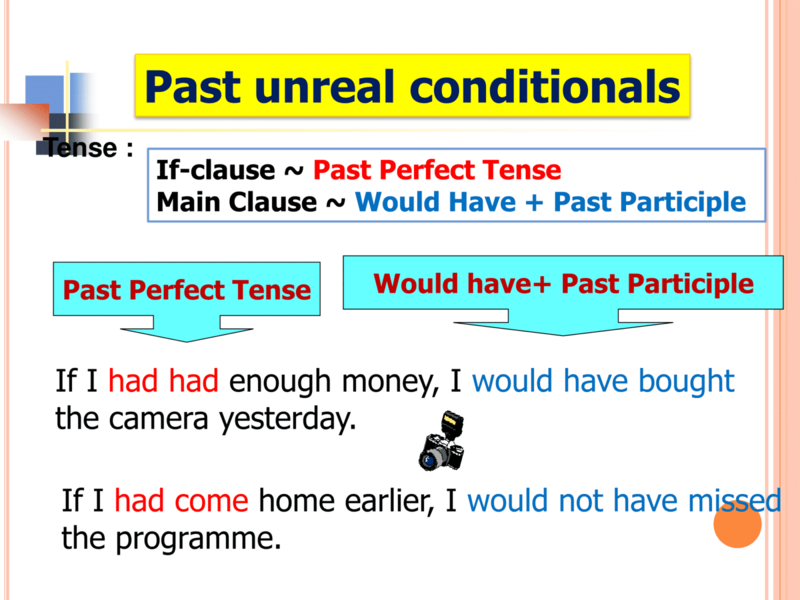 When the consequence refers to the past, but the condition is not expressed as being limited to the past, the condition clause is expressed as in the second conditional (past, but not past perfect), while the main clause is in the conditional perfect as in the third conditional. If we were soldiers, we wouldn’t have done it like that.